Corporate America: now a real thing. For those of you who don’t follow the blog regularly, I kickstarted my first board game, Corporate America, way back in November of 2012. It’s now July 2013, and I just posted an update to my Kickstarter supporters announcing that the project is complete! I chose to self publish Corporate America for a number of reasons. I want creative control, especially with a topic that might be too controversial for an established publisher with a reputation to maintain. Publishers can sometimes drag their feet in getting a game released, and I’m impatient. Finally, and most importantly, I want to learn. I want to understand how to make a game from start to finish, and I think the best way to learn is to just do it. Today I’m going to share one aspect of my experience with you: how much the whole ordeal cost. I could not have made Corporate America without the generous articles other game designers and publishers have posted online. Especially useful for me were Byron Collins’ Game Design & Self-Publishing – A Resource for Game Designers and Brent Povis’ Game Design and Self-Publishing: A Primer for Self-Publishers, both on Board Game Geek, but there are countless useful articles out there. By sharing my experience, I hope to help other aspiring game designers achieve their dreams… or at least know what they’re getting themselves into. Before today’s main event, I want to emphasize that my background is not in business. I come from a programming and game design background, and have picked up the little business savvy I have as I’ve gone along. I’m sure a lot of experienced publishers will question some of my numbers or laugh at some of my mistakes, but if you’re new to the industry, seeing some of the problems I encountered might help you avoid them yourself. Let’s jump to the chase. How much money did it take to produce and distribute Corporate America, and how much was I able to raise on Kickstarter? As you can see, I raised a staggering $20k (and even then, I just barely hit my goal), but still fell about $9.5k short of total costs. In a minute I’ll break down the costs so you can get a better idea of why making a game is that expensive, but first I’ll explain what I got for that $30k. 1630 copies of Corporate America were produced and made their way from Panda GM‘s China factory to Game Salute‘s New Hampshire warehouses. Of those games, about 275 went to Kickstarter supporters, leaving me with around 1350 to sell. The game retails for $40, but it is quite rare that I will keep all $40 for myself. When you buy from Game Salute, I get most of the money, but for every extra middleman between me and a customer, my slice of the pie diminishes. The game sells to brick and mortar shops for $20, halving the potential earnings. It’s too early to say, but I’d guess I’ll average around $12-15 per game sold. If I sell all 1350 extra copies of the game, I will definitely make up the difference between the cost to produce the game and money raised on Kickstarter, and will even have made a profit. But selling 1350 copies of any game is very challenging (even one as awesome as Corporate America), so that’s a big if. The moral of the story: do it for the love, not the money. I know some people have turned making board games into a thriving livelihood for themselves, but it’s not easy, even with the support of Kickstarter. Before going over the costs, I want to tell you what I did NOT include. I limited myself to Corporate America specific costs. Anything for Nothing Sacred Games generally was kept out of the equation. That means I spent even more money while developing Corporate America. I registered the business. I bought domain names and hosted this website. I set up my home office. I purchased graphic design software. And of course I bought materials for building lots and lots of prototypes. But these are mostly one time costs, and if I self publish another game, they will already be covered (mostly). 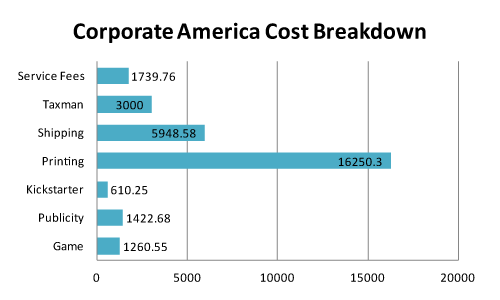 Below is the cost breakdown. I’ll get into a bit more detail about the different categories afterwards. Service Fees: Before I even got my $20732 from Kickstarter, Amazon and Kickstarter had already taken $1739.76 for themselves. You need to expect them to take about 10% of whatever money you raise. Taxman: I timed my Kickstarter campaign to coincide with the presidential election in November, when I thought political interest would be at a peak. I didn’t really think much about how it would fit in with the tax cycle. Unfortunately, the tax cycle did not line up well. I wasn’t able to spend the money in the same year I raised it, so I had to pay taxes on it. The good news is I’ll almost certainly be way in the hole this year, so I probably will have to pay very little in the way of taxes, but last year I took a pretty big hit from Uncle Sam. Note that $3k is approximate. Shipping: It turns out, moving physical objects is not cheap. This total includes both shipping from China to New Hampshire (about $1500, less than I expected because I was able to combine ship with a few other games), and shipping to backers (well over $4000, more than I expected because shipping costs went up between the time I calculated expected shipping costs and when the games actually shipped). This total also includes shipping other Kickstarter rewards, which was small compared to shipping the games but not insignificant. Printing: Exactly what it sounds like: how much money I paid Panda GM for their top notch job on Corporate America. Also hidden in there is the $60 required to wire two payments to them. Kickstarter: This includes money spent specifically on the Kickstarter (like props and software for the video) and the cost of Kickstarter extras (in the case of Corporate America, the presidential hats). Publicity: You’ve got to spend money to make money. This includes advertising the Kickstarter campaign, submitting the game to and attending conferences and conventions, and having the game reviewed before the Kickstarter went live. The biggest chunk of this comes from advertising on Board Game Geek (probably essential for the success of the Kickstarter), but making and shipping prototypes around the world was also costly. Once the game stabilized, I used The Game Crafter for professional looking prototypes. It is an excellent service, though fairly pricy (getting a copy of Corporate America produced by them is significantly more than the retail price of the final game). Game: This is the money required to actually make the game. The majority of it went to artists, and I think I got a steal here. Two very talented artists, Chrissy Fellmeth and Karen Siebald, did an amazing job bringing the game to life and gave me bargain deals. I took care of a lot of the art and graphic design myself, keeping costs down, but I had a couple of excellent mentors (including the famed Slim Mittens) giving me feedback and advice free of charge. Other costs in the game category include buying a bar code, getting a test prototype from The Game Crafter, and finding Game Salute as a distributor. So, that’s why Corporate America cost as much as it did. I honestly think I lucked out on how little it cost. I made some mistakes and wasted some money along the way, but I did a pretty good job of keeping costs down when I could and only spending when necessary. That said, many friends put a lot of free time and labor into the project. The Kickstarter never would have succeeded without friends acting in the video, providing equipment and advice along the way, and helping to spread the word (not to mention their generous financial contributions to the campaign). Thanks guys–you’re awesome! Before concluding today, I want to answer one more question. How much of that $30k did I have to pay before the Kickstarter ended successfully? In other words, how much money was I betting that Corporate America would be made before I knew it actually would be? 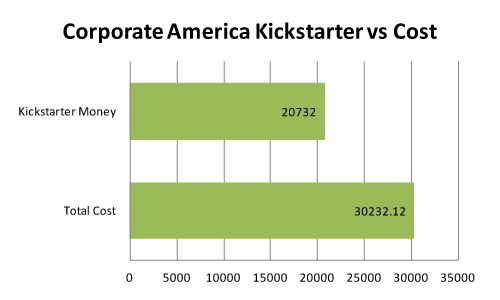 As you can see, I put down about $2k on Corporate America, which would have been thrown away if the Kickstarter was unsuccessful. Compared to $28k, that might not seem like much, but that’s a lot of meals! Most of this money was spent on art for the game, getting reviews of the game, getting the campaign set up (mostly the video), and advertising during the campaign. That said, that number should actually probably be higher! I should have publicized the game more before the campaign started, especially going to more conventions. I also should have established Game Salute as a partner before the campaign was successful. That would have simplified my life a lot. 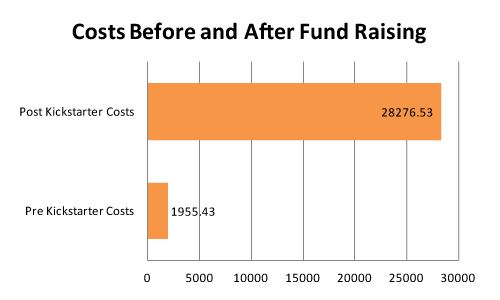 And there you have it–the monetary cost of producing a board game, and how much Kickstarter can help out. But it turns out, making a board game doesn’t just cost a lot of money. It takes a lot of time, too. In my next post, I’ll discuss the timeline for Corporate America, mentioning the milestones the game hit between conception to the shrink-wrapped package-of-fun it has become. Update: The next post is now up. Thanks for letting me be part of such an awesome project. I know the folks at Enchanted Beard Press learned a lot from their first game, too. That first self-published game is always an interesting business/finance lesson. But well done on your success, and congratulations on getting Corporate America picked up by stores. That’s super exciting. you just wrote about my unsolved issues of my crowdfunding dreams. How can I continue after crowdfunding. 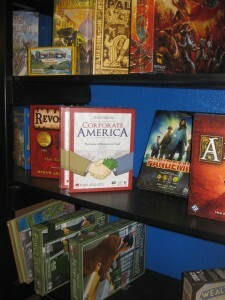 There is a lot of information on how to kickstart, but there is nearly no information online how to sell a board game. Thank you for offering this information. Thank you so much for sharing these details! This stuff is fantastically useful for other would-be self-publishers. You are doing the world of game design a great service, and I for one appreciate it! Nice write-up, I bet a lot of people will be surprised at how much it ‘costs’ to really run a Kickstarter project. By now you’d think everyone would realize that Kickstarter isn’t some magic lever which, when pulled, dumps money on the project creator, but I never cease to be amazed. That said, I notice that your cost breakdown has $ amounts for manufacturing (physical product) and you’ve allotted for art costs, but nowhere does it seem to account for game content. Presumably this is your own design, and you did not need to pay a designer for their IP, or royalties… which basically means that for all the time and effort you put into designing the game (let alone setting up and running the Kickstarter project, advertising it, and getting the game produced), your ONLY reward is to see it on the shelf. I suppose you could say that any profit you make, after covering the costs of production, represents payment for your time and effort. I’d be interested to see that covered in analysis like the above. Unfortunately, there’s not much that can be done about this until consumers begin to value game content. I think that right now, game designers fall into the starving artist category of occupations, like musicians and painters. You can scrape by, accepting most of the risk, but you can’t really expect to life off of it (although a very small number of especially talented/lucky ones do get rich). There are just too many people trying to do what you’re doing and not enough money to go around. Is that a problem with society/the industry? Probably. I certainly wish I could do what I love and make a good living from it. That said, money isn’t everything, and there are some less tangible benefits from designing a game like this. I’ve gained both reputation and fans from making Corporate America, which should make creating another game much easier. If I want to get a job at a game company, I’ve learned to not only design games, I can manage a team, see a game to production, and even sell them. The boost to my portfolio and brand are definitely important, even if they don’t directly kept me fed. And if I’m especially fortunate and Corporate America sells well enough to require a second print run, I own the IP, so it should be much more profitable and much less work for me. A little bit confused here. You say selling through Brick and Mortar takes about 50% and Game salute takes about 25%, how is your average revenue for each copy sold $12-15? Are you saying that profit is about 12-15, including printing? Or are you paying extra for distribution before it gets to the mortar store? Terence, perhaps my estimate is a bit conservative. I should find out soon when I receive my first report from Game Salute. But I don’t think the estimate is too far off for a couple of reasons. First, I have learned that many game stores do not directly order from Game Salute, but go through ACD Distributions. I’m not sure how much of a cut they take, but it will not be 0. Second, not all games will go for even $20. I will give copies of the game to reviewers for free in exchange for them to write or talk about the game (I hope favorably, though you never know!). Also, Game Salute has a policy to give game stores good deals on games for their in-store libraries. I think those games would sell for $10 or so, but I’m honestly not sure. I will follow up with more information about this when I receive my first report from Game Salute in the next couple of weeks. A friend and I are very early-on in the development of a board game company ourselves and have found your insight to be incredibly helpful. Thanks for this outstanding write up! Looking forward to your next post on the cost in terms of time. Typically a distributor takes around 25%, and the retailer takes around 45% of the MSRP. That leaves just about 30% for the publisher. The costs on this game (the $30k everything added in) are $18.54 per game which is pretty high for a $40 game. Even if one counts just the printing and the $1500 from china shipping costs, that still costs $10.88 per game, which is closer to a minimum desired cost to profit ratio on a $40 MSRP game. At that price, one would be making about $12 per copy. And again, that’s not counting any of the additional costs like taxes/publicity/art. Perhaps the percentages are different in this case, I dunno. But usually one wants a minimum of 4:1 MSRP to cost ratio. Disclaimer: I don’t know anything about this particular game’s costs and percentages beyond what was written in this post, so its just educated guessing. Looks like your game has some good company on that shelf 🙂 Great article! I hope you are able to sell through. Thank you for your knowledge and expertise. It was truly a helpful article. I am researching on how to publish a board game of mine and this was really helpful. Please let me know when you decide to share any other knowledge on board game article. Also, if you have any other insight for a beginner like myself, please let me know. Thank you very much for your insightful post. I am considering posting a project on Kickerstarter.com I have invented a game and have been working on the development for years now, but I need help. Mine is a music trivia game intended for TV. However, I do plan a game board version , as well. I have gotten several local Access Cable stations very interested in the game show. And they have asked me for video samples. I was able to get a professional working actor to host, professional videographers to agree to shoot, and some friends to agree to act as game show contestants. My problem? Getting my “friends” and associates who have the knowledge and graphic skills to help without pay. They tell me they don’t volunteer their services. I get it. People want to get paid! I even sought the help of tech and art school students… same problem. I sent emails to school department, but to no avail. A bigger problem is I have shared the total concept with one, too many people and even though I have done the poor man’s version of the copyright, I don’t feel my idea is safe. I have developed a PowerPoint version of the graphics, however, anyone wishing to steal my idea can still do so with their own version. But they’ll have to fight me tooth and nail over it. I still consider myself at the very beginning of development of my game, which still need copyright and patent protection. What exactly would I post, how much information on the project for this game without giving away too much information should I post on Kickstarter? Don’t worry about patent and copyright protection. Anything you produce automatically has copyright protection. And for better or for worse, it’s basically impossible to patent game mechanics. If someone wants to steal your idea, they will be able to. Thankfully, most people in the game industry have more integrity than that, and if they don’t, they will be ostracized from the community as soon as people find out how they work. What you should worry more about in preparation for your Kickstarter is the quality of your game. Has it been thoroughly playtested? Does it look good? 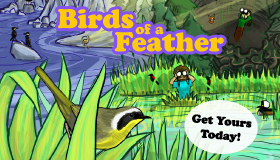 Have you raised awareness and excitement about the game in advance of the campaign? Your game should be basically finished by the time it goes up on Kickstarter. If it’s not, very few people will be willing to give it a chance. Informative article, I found it very helpful! My physics class is currently conducting a project where we must create a proposal for a board game. You mentioned that you did not include costs of materials for prototypes, the domains and site you made, and the graphic software you purchased. I would be extremely appreciative if you provided me some figures that I could use for project…Thanks! If you are only setting up a studio for a class, I would not recommend setting up a webpage or buying Adobe software. There are open source alternatives (Inkscape, Gimp) that are nearly as good and totally free. How much does it cost to create a single game? That depends on what you mean by a single game. Do you mean how much does each game cost when you produce a large order like 1500? Or do you mean how much does it cost to have a single copy of a game produced with no others? Just one single game. How much for one single game? Great article ! Thanks for all the stats and the in-depth analysis ! It’s extremely helpful for new comers ! Interactive Media – Directory. | Films and that.